Humans have long sought ways to extend life and libido. But did you know the discovery of Viagra was a mistake? What was at the time a giant stuff-up has resulted in many happy people (and a resounding success) since. The breakthrough did not occur as a result of researchers experimenting with ways to make men more manly. Instead, the discovery happened while testing sildenafil as a cure for hypertension and heart disease. After two phases of testing, researchers came to the conclusion the drug failed to show promising results for the heart. Epic fail on that front. BUT test subjects noted, well, it did wonders for other parts of the anatomy. Bingo! So what does Viagra have to do with leadership? We have a lot to learn from the story of Viagra’s discovery. As leaders, our relationship with failure is usually a harsh and merciless one. Organisations are, for the most part, very unforgiving when it comes to failure. You only have to look at the CEO graveyard, littered with leaders who didn’t ‘perform’ for merely one year of poor results, to see this phenomenon in action. We all know mistakes are a mechanism for growth and learning – so why is this belief so lacking in corporate culture? The measure of a company’s success is normally a short-term, myopic focus, where financial results are the primary indicator. We need to change the way we view failure. 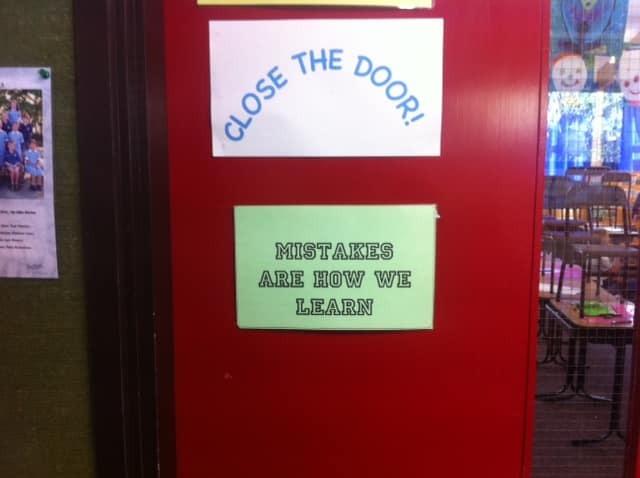 The door to my son’s classroom is a simple reminder of the value of mistakes. We need to change our response when there’s a hiccup or a monumental stuff up. Repeated mistakes and ongoing poor performance are another matter altogether. But there are countless missed opportunities for learning, growth and discovery, merely because leaders view mistakes and failure as inherently bad. When someone in your team makes a mistake, or when something goes wrong, what is your response? What do you notice about how mistakes are treated in your organisation? Is there calm and considered exploration of the root causes, in order to understand and learn from the situation, or is there a witch hunt and blame game? Do you think there needs to be a paradigm shift? I would love to hear your thoughts – please leave your comments in the space provided below.